Just like Cookie Monster who’s “me love cookie” tirades have become infamous, I, too, have a love of cookies. And who doesn’t? Cookies are the perfect comfort food, bringing back memories of childhood to most anyone who indulges in a crunchy or chewy (depending which is your favorite) cookie or two from time to time. But sadly, when adulthood arrives and waistlines begin to expand after having children or even from the infamous “Freshman Fifteen” that sneaks up during college, our cookie days usually come to a halt. Sure, we indulge our love of cookies now and again, but not like we did when our higher metabolism during our teen years allowed us to have a pack of chocolate Chip’s Ahoy without thinking twice. Fortunately, there are some ingenious folks who have realized that cookies are for everyone! 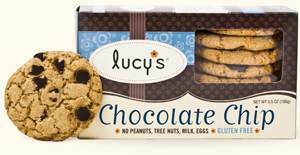 Enter the new cookie line available at Starbucks…Lucy’s cookies. These cookies were actually developed by a medical doctor whose child suffered from food allergies. They are light and airy and have a decadent texture that gives you the taste and feel of a cookie without all the junk – and these cookies taste like they just came out of your grandma’s oven. I stopped in for a coffee and walked away in blissful triumph with the knowledge that yes, I could eat cookies again. And eat them I have been. I’ve tried all four of the current Lucy’s Cookies flavors, and although I can’t really determine yet which is my favorite, I’m sure I’ll get ample opportunity to figure that out as I think these are a really healthy treat that I’ll add to my list of must-haves! So yes, I will be eating oatmeal, chocolate chip, cinnamon thin, and sugar cookies in the near future! So here’s the low down on Lucy’s Cookies. They contain no peanuts, tree nuts, milk, eggs, or gluten. They are made with organic ingredients like organic palm fruit oil and soy milk. The sugar, cinnamon and chocolate chip varieties contain 130 calories per serving (three cookies, 3 weight watchers points so one point each) and the oatmeal contains just 120 calories. These yummy cookies are also cholesterol free! They are available at coffee shops, Whole Foods, as well as online at Amazon. So grab a glass of almond milk or low calorie coconut milk and start dunking! ... and if you are in the cookie mood, make sure you check out my other postings, like cookies and cream shakes, cookies and cream ice cream, almondia cookies, and yummy cookie buttons. Mm!! These look great! My son recently developed a dairy "issue", these would really fit the bill. So glad you posted this!